GeoStabilization’s Grouting & Foundation services provide solutions for geohazard-related projects involving grouting, seepage control, settlement control, sinkhole rehabilitation, foundation underpinning & re-leveling, and new foundations throughout the United States and Canada. Compaction grouting otherwise known as low-mobility grouting is a ground improvement technique that improves the strength and stiffness of the ground by controlled, high pressure injection of low-mobility cementitious grout. As the grout mass expands, the soil is displaced and compacted. If injected properly, the grout does not flow away from the injection zone or significantly permeate the surrounding soil. The result is a series of very stiff, bulbous grout columns surrounded by soil of increased density. The process is roughly illustrated in the left graphic below. Compaction grouting is used for sinkhole repair, improving soil under new or existing structures including the releveling of structures, the improvement of collapsible soils, liquefaction mitigation, and general ground improvement and settlement control. 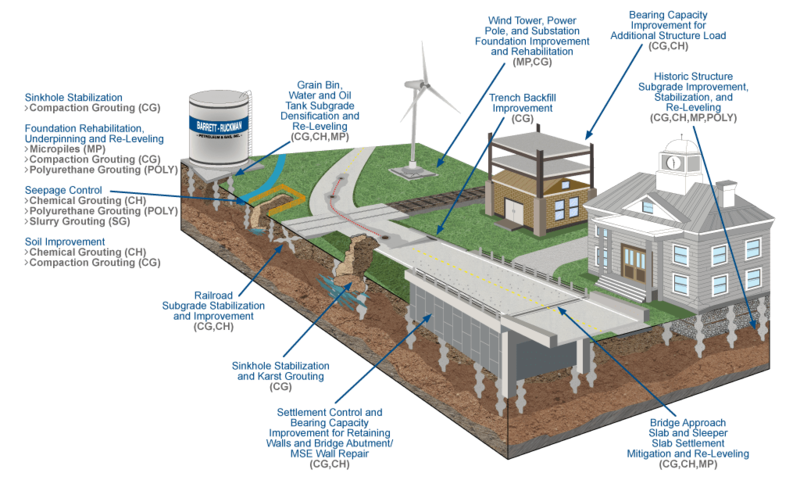 The right graphic below shows the varied uses of compaction grouting as it relates to existing infrastructure. Micropiles are small-diameter (typically less than 12 in), drilled and grouted pile foundations that are typically reinforced with a casing and/or a center reinforcing bar. A micropile is constructed by drilling a borehole using several nuanced drilling techniques, placing reinforcement, and tremie-grouting the hole typically with neat-cement grout. Micropiles can withstand axial and/or lateral loads, and may be considered a substitute for conventional piles or as one component in a composite soil/pile mass, depending upon the design concept employed. In order to handle lateral loadings, micropiles are often installed in a battered configuration, or with a permanent stell casing at the top of the pile. Micropiles are installed by methods that cause minimal disturbance within or next to adjacent structures, soil, and the environment. They can be installed in access-restrictive environments and in all soil types and ground conditions. 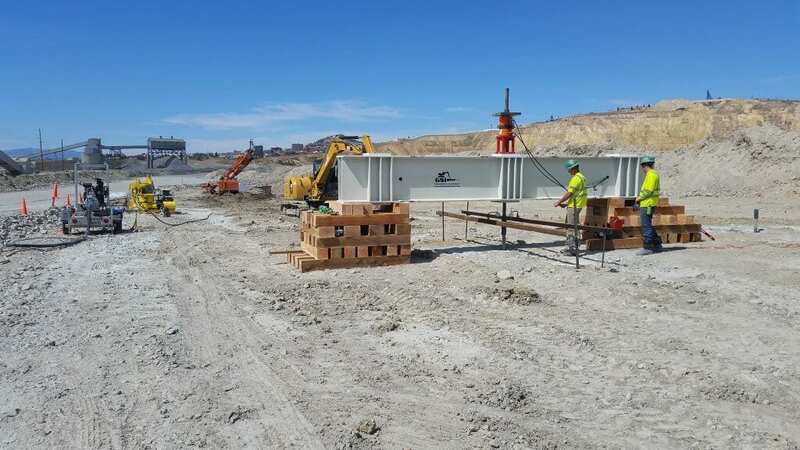 Since the installation procedure causes minimal vibration and noise and can be used in conditions of low headroom, micropiles are often used to underpin existing structures. 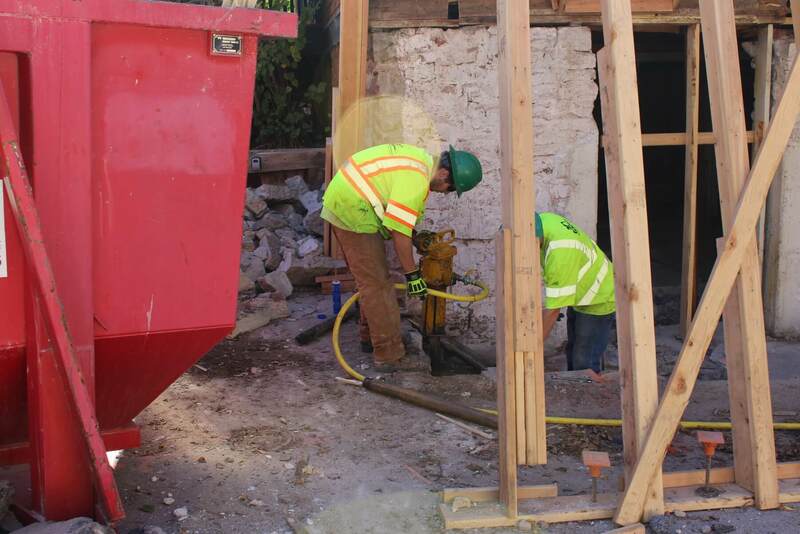 Specialized drilling equipment is often required to install the micropiles from within existing basement facilities. 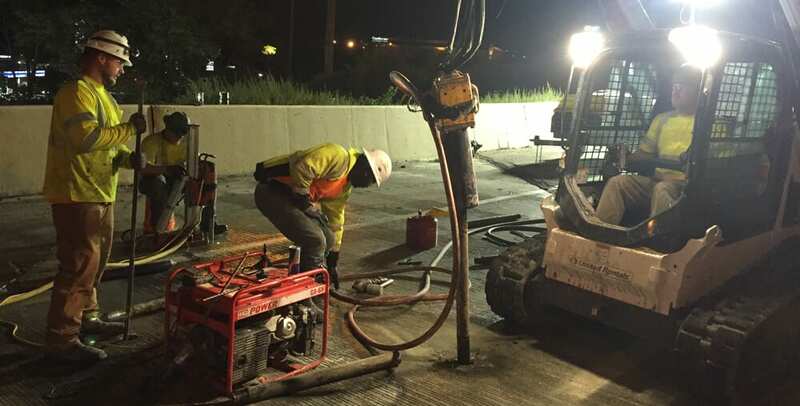 Polyurethane grouting is the process of injecting expanding polyurethane grout into voided areas or directly under roadways, inside structures or under slabs-on-grade in order to fill voids or relevel slabs. Polyurethane grout is often used in concert with compaction grouting whereby compaction grouting is used to densify the soil at depth where consolidation may be occurring leading to surface settlement, and polyurethane grouting is then used to relevel slabs on grade and fill any existing voids, or voids created by the releveling work. 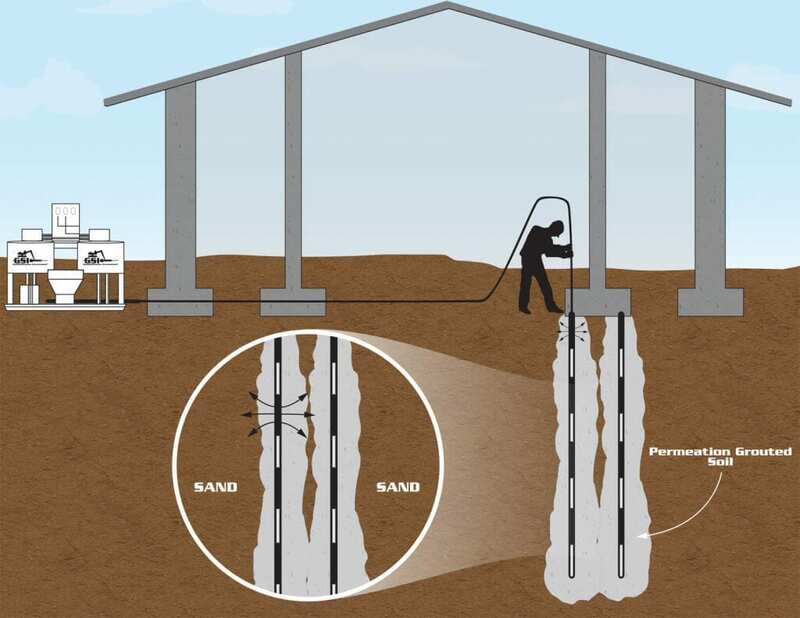 The combination of these techniques thus treats both the cause (by the densification of loose soils) and the symptom (by the filling of voids and releveling) of the settlement. The use of polyurethane grouting only to fill voids and relevel structures near the surface would allow settlement to continue and require additional re-leveling at a later date as the loose soil at depth continued to consolidate. Slurry grouting is the injection of neat cement grout mixed at various proportions into open graded overburden soils such as clean gravels, or into bedrock in order to improve the characteristics of the in-situ material during temporary or permanent excavations or around existing below-ground infrastructure, to reduce water seepage, for underpinning or to improve the load carrying abilities of the soil. In situations where the cracks and fissures or the soils are too small to allow the cement slurry grout to permeate these spaces, microfine cement can be used in order to improve the cement slurry’s ability to permeate the cracks and fissures or soil. Permeation/chemical grouting is a grouting technique similar to slurry grouting described above and is used to permeate soils such as clean sand and silts with fines contents up to approximately 15%. This method utilizes cement, microfine cement, sodium silicate and acrylamide grouts in order to permeate the soil and when done on designed patterns and grids creates solidified soils with characteristics similar to that of weak bedrock. 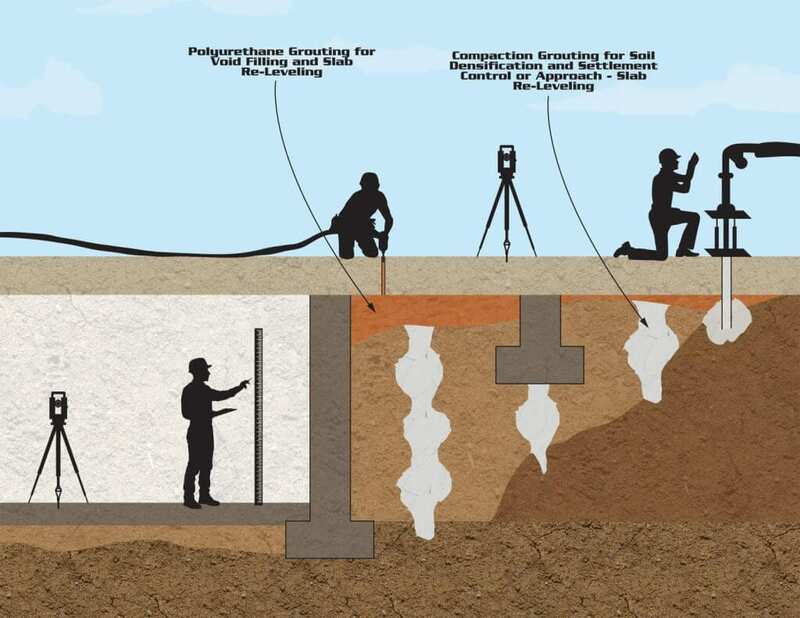 Permeation grouting is used to control water seepage, provide temporary and permanent underpinning of existing foundations, and improve the bearing capacity of soils under existing foundations and for excavation shoring. Permeation and slurry grouting often uses specialized installation techniques and methods including the use of down-hole packers, tube-a-manchette grout pipes and specialized grout mixing and batching equipment.